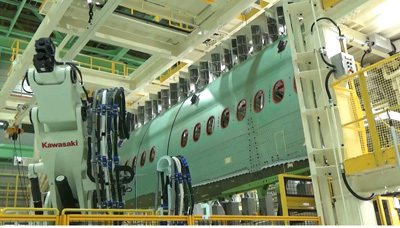 Kawasaki Heavy Industries, Ltd. announced today that it has started delivery of fuselage panels for the first 777X, Boeing’s cutting-edge wide-body passenger airplane. Those fuselage panels will be shipped by sea to Boeing’s 777X assembly plant on the outskirts of Seattle in the USA. Kawasaki is responsible for manufacturing the forward and center fuselage panels, main landing gear wheel well, aft pressure bulkhead, and cargo door sections in the 777X project. Final assembly of the forward and center fuselage panels delivered this time is conducted at the 777X assembly plant at Nagoya Works 1. 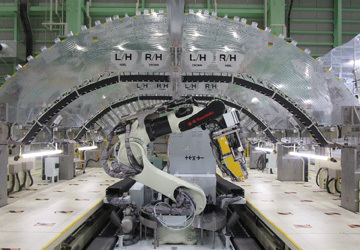 The 777X assembly plant, which was completed in February 2017, further advances facility automation through the introduction of newly developed equipment utilizing the latest in image sensing technologies and control technologies developed with the technical synergy of the company as a whole. The new equipment includes Kawasaki-made robots capable of automatically detecting bore points and carrying out boring operations as well as auto riveters with an expanded operating range. Moreover, the assembly lines incorporate the Kawasaki Production System* to achieve high-quality, high-efficiency production operations. 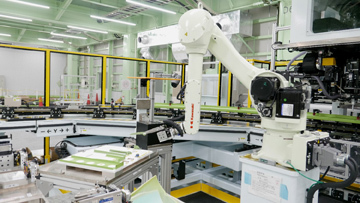 Kawasaki is also actively promoting the improvement of facility infrastructure, including ICT, IoT (Internet of Things), and other technologies, with the goal of transforming the assembly plant into a smart factory. Kawasaki is taking part in the Boeing 777X project with the aim of achieving technologies that facilitate stable, reliable production of high-quality products over the long term, while also striving to expand its commercial aircraft business. Based on the Just-In-Time system, the KPS uses Kawasaki’s proprietary logical production management techniques, which were developed and proved effective in-house by being applied on production lines. The system can be implemented in any production line, regardless of whether it is a mass-production or make-to-order production line. Max. takeoff weight 775,000 lbs. This robot, which performs automated boring of holes to facilitate joining of skins and reinforcing elements via bolts and other parts, uses newly developed image sensing technologies to achieve precise bore positioning. This robot, which performs automated tacking (temporary joining carried out prior to final joining) of skins and reinforcing elements, uses newly developed control technologies to achieve precise operations in narrow, tight spaces. Automatic part installation is achieved by flexibly controlling the installation positions in accordance with drawings. This automated machine for joining fuselage skins is designed to be more flexible than standard riveting equipment, thus enabling riveting for more difficult/complex sections. This automated machine for joining skins with reinforcing (frame) parts is designed to allow precise operations in narrow, tight spaces, thus enabling riveting over a wider area.